Homemade gifts and meals/desserts are my favorite gifts to give. It was something that my Mom was always fond of doing and she taught us early on to do the same. Of course, at the ripe old age of 6 or 7 years old I was probably giving things that no one was excited about getting (I seem to remember once throwing together a seasoning mix that consisted of every spice in my Mom’s cabinet…whoever received that unsavory gift and had to pretend to like it, I am forever sorry!). Luckily (for the giftees), I’ve come a long way from my spice concoction days. However, homemade food is still my favorite gift to give. I believe nothing shows your love and appreciation for someone quite like presenting them with a beautiful treat or home cooked meal that you’ve put your heart and soul into. With this in mind, it seems only fitting that my Mother’s Day gifts and treats are inspired by the OG homemade gift maker herself. 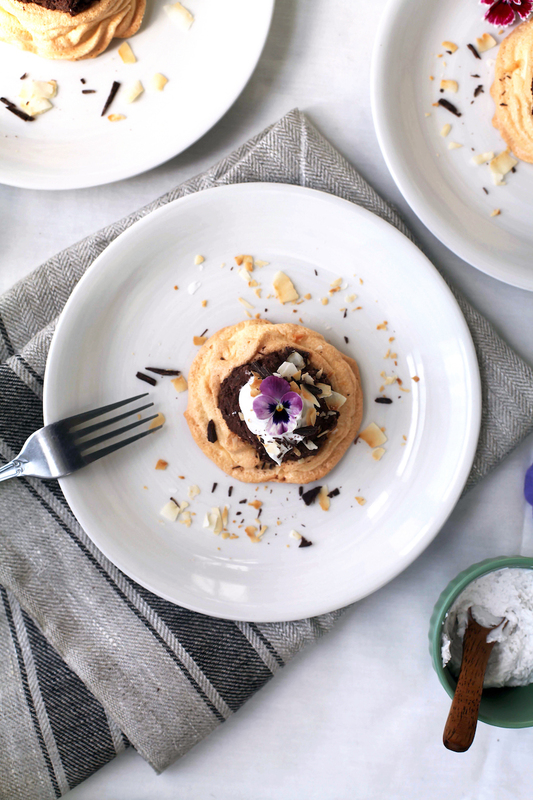 These pavlova cups with coconut chocolate mousse, in particular, had me taking lots of cues from my Mom. Pavlova is her favorite dessert and, of course, she's the one who taught me everything I know about flowers, so the cups and the edible flower garnish were a no-brainer. But this dessert, that just so happens to be gluten-free and sweetened entirely with stevia (Yay for less calories! ), is also inspired by one very special chocolate brand. Lily’s Sweets was introduced to me a few months back, and with both the story behind the chocolate and the incredible flavors of the product, I’ve been hooked ever since. Lily’s is sustainably made, vegan, gluten-free and non-GMO, but it doesn’t stop there. All of their products are sweetened with stevia. Translation- you get a delicious chocolate indulgence without all of the not-so-delicious calories. Truly, it’s one of the best chocolates I’ve ever had (and if you know me, you know I’ve had a lot of chocolate). They are available in tons of stores and even on-line (see where to find their products here) and they offer a variety of products, everything from baking bars to baking chips to flavored bars (I can’t get enough of the Salted Almond & Milk! ), so from snacking to cooking they’ve got you covered. Another thing that always catches my eye and makes me fall hard for a brand is when I see how dedicated they are to giving back. Lily’s is actually named for one of the co-founder’s niece, a childhood brain cancer survivor (you can read about her story here). While Lily herself is now cancer free, Lily’s Sweets gives back a portion of their profits to organizations that help children with cancer. I mean, if eating healthy chocolate that gives back to help kids with cancer isn't sweet (literally and figuratively), then I don't know what is! Do note, if your mixing bowl is not completely clean or the air is very humid, there can be a negative effect the outcome of your pavlova cups, so just be mindful of these things when making this recipe. The pavlova cups can be made ahead and stored in an airtight container until ready to serve. The coconut cream can be made ahead and stored in an airtight container in the refrigerator. However, I would recommend allowing it to soften and then beating it again for a few minutes before serving. Thank you to Lily's Sweets for partnering on this post.